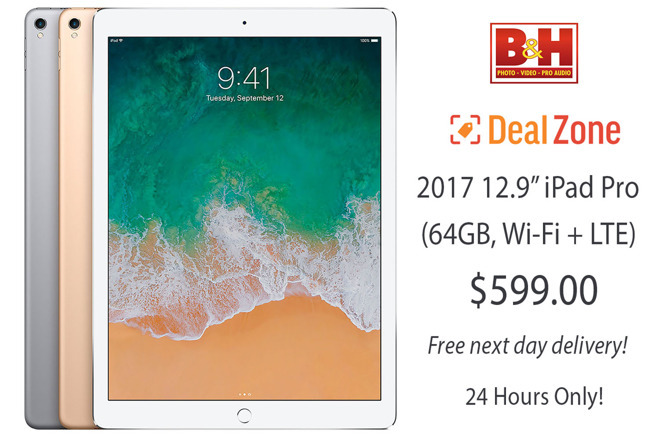 While supplies last, B&H Photo is slashing the price of Apple’s Mid 2017 12.9-inch iPad Pro with 64GB of space and Wi-Fi + Cellular functionality. Priced at just $ 599 after a $ 330 instant discount with free next day shipping and no tax in many states, this is the lowest price available for the LTE model during the special DealZone event. For one day only, Apple’s 2017 12.9-inch iPad Pro (64GB, Wi-Fi + Cellular) is on sale for $ 599 in your choice of Silver, Space Gray or Gold thanks to a special Tuesday DealZone discount. At $ 330 off, this is the lowest price available from an Apple authorized reseller with many retailers completely sold out. What’s more, B&H is throwing in free next day shipping within the contiguous U.S. for delivery by Christmas. B&H also will not collect sales tax on orders shipped outside AL, HI, IL, IN, KY, MD, ME, MI, MN, MS, NC, NJ, NY, ND, NV, OK, VT, WA and WI. For many shoppers, this can equate to another $ 48 in savings on top of B&H’s instant rebate. To take advantage of the special offer, simply select your desired finish through this DealZone link now through 11:59 p.m. Eastern on Dec. 18, or while supplies last. And for even more flash deals, be sure to check out our holiday deal roundup. You can easily tack on an AppleCare extended protection plan to these 12.9-inch iPad Pros for $ 129 by selecting the AppleCare option in your cart.